Last month, I wrote a post about Planning your Maui Runcation, in which I highlighted places to stay, where to find local races, and what to do when you aren’t running. Well, I just got back from 6 blissful and relaxing (i.e.kidless) days on the island and am finally recovered enough to write this post. While we spent the vast majority of our time eating local faire and reading on the sunny beaches, the things that will bring me the longest lasting memories will be exploring some local running routes and our Molokini Snorkel Cruise with the Pacific Whale Foundation. The Pacific Whale Foundation actually puts on a race each February called the Run & Walk for the Whales. The 2017 event will take place on February 4 and features a 5k, 10k, half marathon, and 2.5 mile walk. “All proceeds from the event support Pacific Whale Foundation’s humpback whale research in Hawaii and other parts of the Pacific, marine education programs for local school children, as well as conservation programs including efforts to keep marine debris out of our oceans, prevent vessel-whale collisions, and end whaling worldwide.” The races take place at Maalaea Harbor and all participants will receive a shirt to go alone with the event. Afterwards, registered runners will receive 35% a post-race whalewatch cruise. I checked out the course and can attest to a few things – it’s beautiful and it’s windy. Maaleaa is actually the World’s 2nd windiest harbor, and that definitely came to light when visiting. Our tour actually ended up getting postponed twice due to weather – probably mostly because of additional stormy conditions due to two hurricanes in the immediate area. The race course is no different. The races are out and back that start near the harbor, head along Highway 30 and then along Highway 310 towards Kihei before returning. During my run, the first 1.5 miles were straight into a vicious headwind. So basically, 5k runners will struggle for the first half of their race, and then CRUISE back to the finish. Even along the highway, there was a steady cross breeze that made things a challenge. I am guessing that there are cones and notifications along the highways during race time, so I don’t necessarily trying the route on non-race days (like I did). Traffic was generally fine, and there was some shoulder room, but they were still highways and I was extra cautious. I later found that there is a LONG stretch of bike/pedestrian trail along Highway 311 that you can put in a lot of straight miles as well. But the race course, despite the wind, is sure to be great. There are solid views of the Maalaea Bay on the way out and the hills of the West Maui Forest Preserve on the way back. Runners will also pass by the Kealia National Wildlife Refuge and half runners will get to experience Kihei a bit before returning. If you are looking for an opportunity to visit Maui, or happen to be in the area and want to race, mark February 4, 2017 on your calendar. Now on to the snorkeling. One of my wife’s and my favorite experiences from our last trip to Hawaii (6 years ago)was taking a snorkel tour. While there are a variety of companies who offer tours in the pristine Hawaiian waters, I am specifically fond of the Pacific Whale Foundation. There are a couple of things we really liked about back in 2008, and those things held true this trip. PWF is a non-profit. They aren’t one of the slew of charter boats (which I am sure are great), who may just jet you out there and set you free. Part of their mission is to educate people about the Pacific Ocean and the wildlife in it. They hold true to strong values about conservation and about what’s best to keep things beautiful for years to come. Their fees go towards a variety of things – from research, to scholarships to local low-income kids, to helping pay for a great crew who are all Masters Level biologists. Speaking of which. The crew. There were 6 crew on board the ship, who completed a variety of tasks. From preparing breakfast, lunch, and drinks to oversight during the dives, they are there every step of the way. They even give mini-teaching sessions along the 30-40 minute trips out to the snorkel spots, covering topics about snorkeling, fish, and even a kid’s session. It was easy to see their conviction and love for the work they do, and that shines through in their communication. Their diversity. There are plenty of great snorkeling near Maui, and PWF provides eco-cruises to all of them. However, snorkeling isn’t for everyone and they also offer other options for sunset cruises, dolphin watches, and stargazing – there is something for everyone. During our trip, we first went over to Molokini, a crater which is said to feature some of the best snorkeling in the Pacific, as the waters within it are better protected from swell and currents than the shore of Maui.. The clear waters offered spectacular visibility, in some ares up to 150 feet. We were one of the first boats of the morning (about 7 more would arrive by the time we left an hour+ later), and it was easy to see what all the fuss was about. We were in the water for about 35 minutes (though other snorkelers stayed out a bit longer), and we saw beautiful reefs, a large array of fish (some of which were in touching distance), and a moray eel. Word has it that sometimes Manta Rays and (harmless?) sharks are seen at times, though we did not on this day. Following our trip to Molokini, our second stop was an hour of snorkeling at Turtle Town Arches. Luckily fo us, our condo was right in some great turtle zones, and we witnessed swimming turtles and one laid out on the beach in the days leading up to our trip. But we were eager to see one in action. It took some time at Turtle Arches, but we did manage to see one swimming turtle. It actually passed a few feet below my feet – which was exhilarating (wish my underwater camera hadn’t ran out of batteries by then though). From the sounds of the shouting throughout the hour, it appeared there were a few other sightings, though we only saw one. During the trip, we were fed well as well. From pineapple, oranges, pastries and coffee for breakfast, to chicken and veggie burgers, bean salad, and homemade macaroni and cheese for lunch, we definitely didn’t go hungry. Add in the return to harbor cocktails (only $3 each, which is a steal) and free cookies when getting off the boat, and you can’t go wrong. It was definitely the cheapest day we spent eating on our trip. PWF definitely lived up the hype yet again, and we felt great about putting our money towards something that was going to be meaningful aside from just being able to fill the boat up with gas. 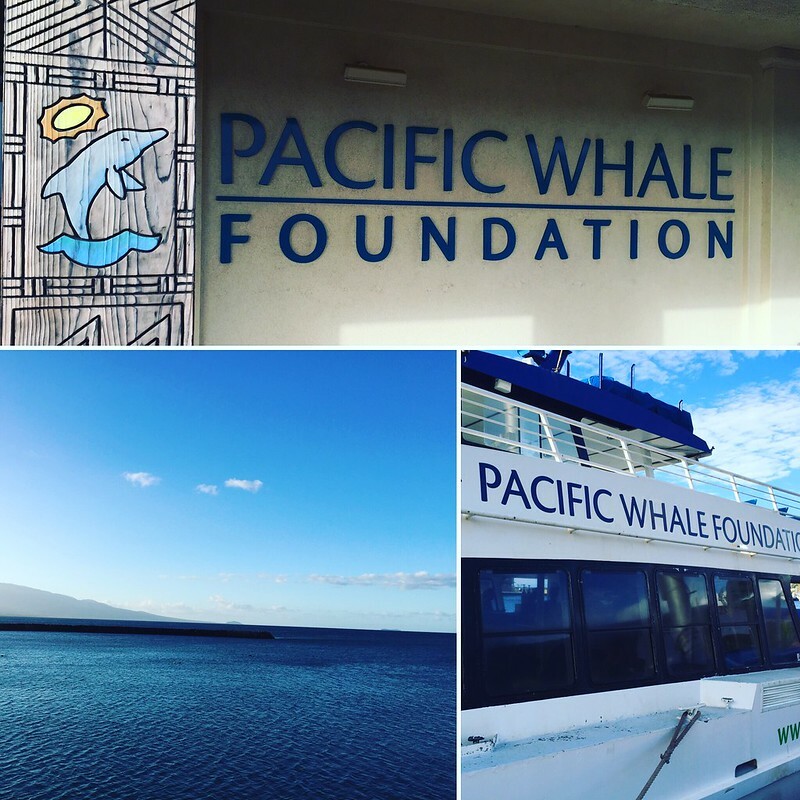 If you are in Maui and wanting to take in a snorkel cruise or some other water-based activity, make sure you check in with the Pacific Whale Foundation first! You can follow Pacific Whale Foundation on Facebook. PWF provided Run Oregon with a complimentary snorkel cruise. However, all thoughts about the experience are Run Oregon’s.